If you like your brownies to be dense, moist and chocolatey, I have the perfect recipe for you. These chocolate brownies are perfect for potlucks! 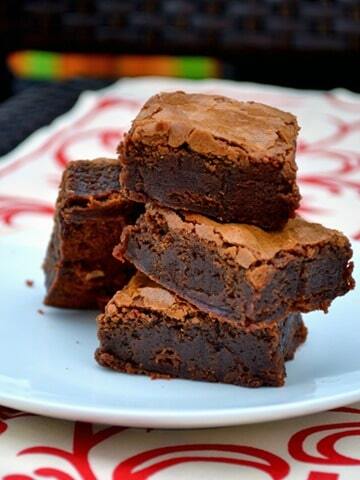 CHOCOLATE BROWNIES! I could live on Brownies – eat them for every meal and not get bored of it. This is my preferred dessert for potlucks because of the low effort needed plus the kids love it. I usually make Brownies using the Ghirardelli Box mix (which turns out awesome by the way) but making anything at home from scratch is always fun. Brownies can be fudgy, chewy etc. I like the ones that are dense, moist and chocolatey in the center and this recipe will get you exactly that kind of brownies. Note: Brownies tend to cook more quickly in a metal pan than in a glass container. I usually start testing for doneness after 25 minutes of baking. 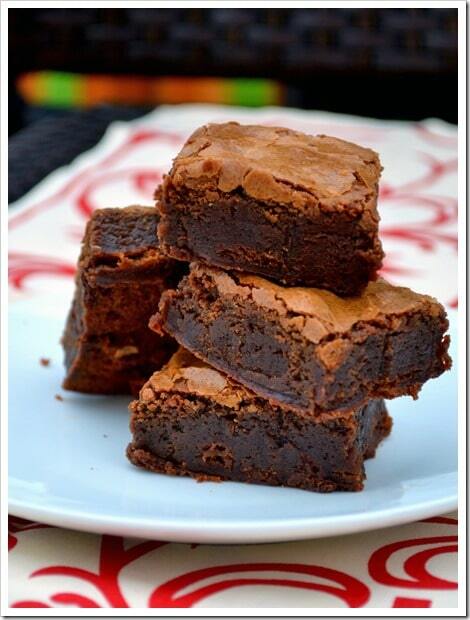 A brownie is considered done if the toothpick comes out with a few moist crumbs still sticking. If you see wet batter, continue to bake for another 5-8 minutes. 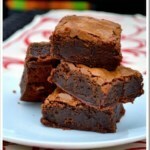 This recipe for Chocolate Brownie has been adapted from Betty Crocker’s Ultimate Brownie Recipe. Store them in the refrigerator and pop them in the microwave and heat it for 15-20 seconds and serve them warm. Preheat oven to 350°F. Spray the bottom and sides of a 9-inch square pan with cooking spray or line the pan with parchment paper. Microwave butter and chocolate in a bowl for 20 seconds. Stir and continue to heat in the microwave in 10-second intervals till most, but not all of the chocolate is melted. Stir the chocolate until it is smooth, shiny, and completely melted. Mix the sugar, vanilla, and eggs with an electric mixer on high speed for 5 minutes. Add in the chocolate mixture and beat on low speed until the chocolate is blended in with the rest of the mixture. Add the flour to the mixture and beat it in just until it is mixed. Stir the chocolate chips in with a spatula. Pour the batter to the pan and spread it out evenly. Bake for 30 minutes and do a toothpick test - a brownie is considered done if the toothpick comes out with a few moist crumbs still sticking. If you see wet batter, continue to bake another 5-8 minutes. Cool completely in the pan on a cooling rack and cut into rows and columns, usually a 4X4 to make 16 brownies.